I don't add the sugar to the apple until just before sealing it up in the pastry, otherwise it gets too juicy - you want the pastry to stay lovely and crisp. Preheat the oven to 200°C/gas 6. Melt the butter in a saucepan and add the apple, lemon zest and 1 tbsp water. Cook gently, stirring, for 5 minutes, until the apples soften. Set aside. On a lightly floured surface, roll the pastry out into a ½cm-thick rectangle. Use a sharp knife to trim any ragged edges then cut into 6 squares. Place 1 tbsp apple in the middle of each square and sprinkle with 1½ tsp caster sugar. Brush the edges with water. Bring one corner over to the opposite one and press the edges together. Make a small hole in the top of each for the steam to escape. 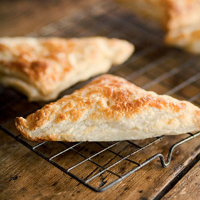 Transfer the turnovers to a large baking sheet lined with non-stick baking paper. Mix the egg yolk and milk together and brush all over the pastries to glaze. Sprinkle over the remaining sugar and bake for about 20 minutes until puffed and golden. The filling will be hot, so leave for a few minutes before eating – with cream or ice cream – or cool on a wire rack and eat cold. You can’t do better than a cup of classic tea.